Thank you for checking our latest newsletter. Below are some valuable links to check along with a report about our highly successful musical production. I have a new Youtube channel that I've been using to interview students. I hope you can take a look (linked below) and possibly subscribe. I hope you have a great spring, and feel free to contact me at any time. The phone number at the High school is 607-869-9636.
offer younger students some great advice. Every month, Mrs. Butler and I prepare a report for the Board of Education. These reports are available through the Board of Education section of the district website. This site has a wealth of information for parents. It will help us all to understand how to help children navigate many challenges. This article discusses that a new study finds that only 5% of teenagers are getting enough sleep or exercise, or are limiting their screen time to what's recommended by experts. All three of these behaviors have been linked to health problems such as including increased risk of depression, poor school performance and obesity. 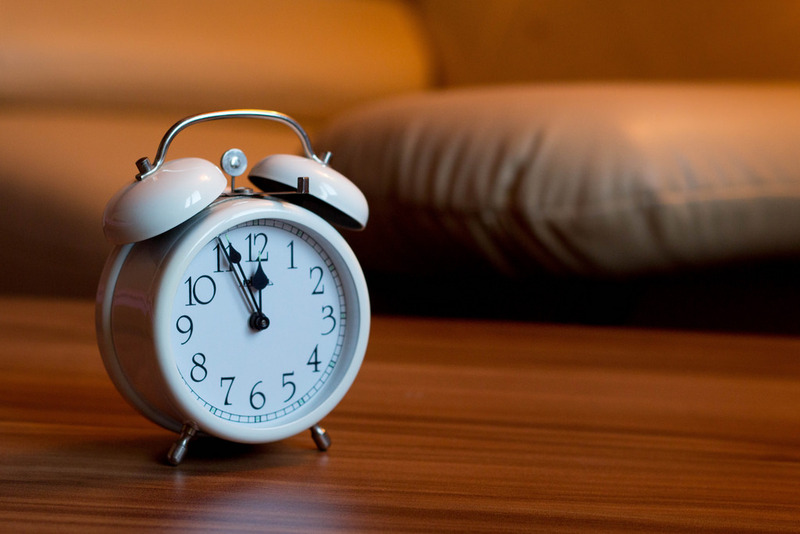 According to the National Sleep Foundation, teens need between eight and 10 hours of sleep per night and one hour of vigorous physical activity daily. The article suggests ways to combat these problems include setting an example, making it a family goal to get enough exercise, rewarding positive behavior, and being realistic. Click the link above to learn more. 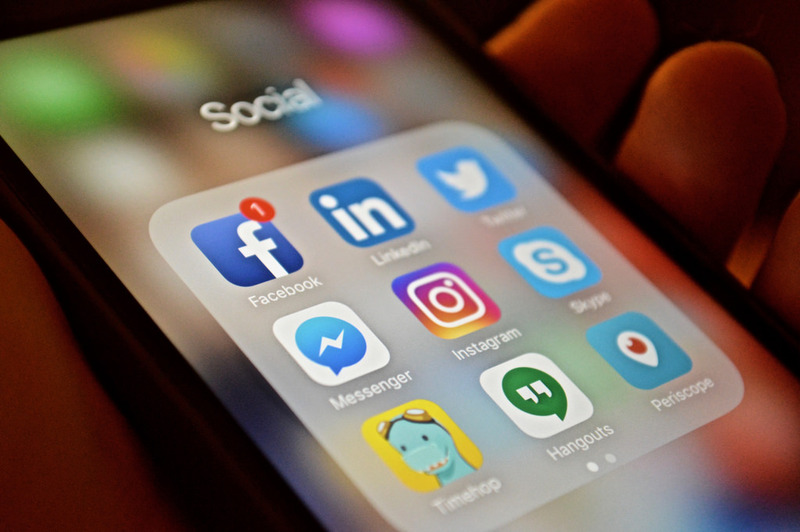 In this article, the Fairview Park Auxiliary Police Association lists a few ways parents can protect their children as they begin to install apps on their phones and tablets. They suggest that parents should Approve every app on your kid’s phone, check privacy settings, talk with your kids about phone use, apps, and social media with your kids, find out what is popular in your region, and different apps catch on in different locations. Click the link above for a more in-depth look at each of the 14 apps. *Article courtesy of Brooke Habberfield, our social worker. “Joseph and the Amazing Technicolor Dreamcoat” was performed on March 22, 23 and 24 at the high school auditorium. The show was directed by Mrs. Tina Bauder. Mrs. Bauder decided on “Joseph” because of its fun and over-the-top nature, perfect for a family-oriented audience. She appreciated that “Joseph” allows flexible casting so that it meets the needs of the students. Once again, the musical was very well attended by parents and community members. The production featured seniors Aden VanCleef, Sarah Corning, Madelyn Houck, Emma Seamon and Julia Hubbard. Madelyn Houck, one of the narrators, says that her favorite part of “Joseph” is the dance numbers and the fun nature of the show. She hopes to attend college to become a music teacher. 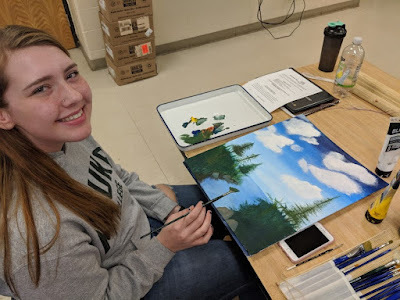 Madelyn loves being involved in theater at South Seneca because it gives her a chance to escape her regular routine: "I get to be with my friends and it gives me something to look forward to." Sarah Corning played one of the three narrators in the musical. After graduation, Sarah plans to attend college and major in psychology. Sarah expressed that participating in musicals was one of the highlights of her high school career: "I will always look back at my time at South Seneca for the shows I've done. It put excitement into school." Mr. Hermanet's Digital Media Production class has been working on designing models and printing them using the 3D printer in the library. Here, Clayton Pollack is shown sanding down a miniature hatchet that was printed using the 3D printer. Bringing ideas from the page to life! We had a blast at the pep rally on Friday afternoon, ending our March Madness Week with some games and dancing! This latest edition of our High School News has some excellent advice on a variety of topics. I hope you can read through them and share with others. Thanks to all of our parents for providing the love and support that students need. As always, I am just a phone call away. You can call the school at 869-9636 and get to either the middle or high school Thank you very much for your support. Students who achieved honor roll for the second marking period were treated to a French-themed breakfast on Monday, February 11th. 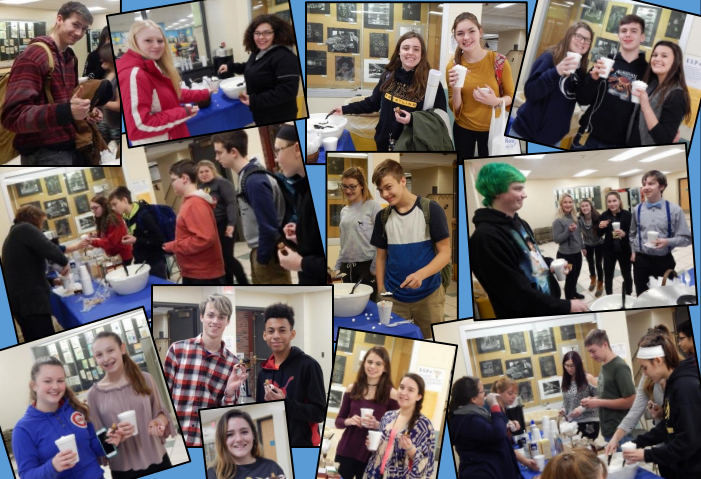 Delicious foods including croissants, parfaits and waffles with fruit were served to students to acknowledge their hard work and achievements. Thanks to Mrs. Stagg, Mrs. Northrup, Mrs. Wyckoff, and Mrs. Zajac for their organizational and imaginative skills! A teacher recently shared the linked Facebook post with me. The author talks about the honor and potential financial benefits of opting out of college. The moral of the story for me is to go for what your passion tells you to. This is a very good editorial written by Karissa Niehoff, the executive director of the National Federation of State High School Associations, and Robert Zayas, the executive director of the New York State Public High School Athletic Association. If you'd like to see a TV news story on the topic, please click here. Thanks. "Undoubtedly, social networking plays a vital role in broadening teen social connections and helping them learn valuable technical skills. But what impact is all of this social networking having on young teen minds? Most reports indicate that the impact can be significant." Check out this article about the five ways social media can influence teens' developing brains. The following stories concern the use of tobacco and e-cigarettes. It's a problem with our youth all over the country, including in our area, and we are attempting to spread the word concerning the harmful effects of the habit. It's apparent that Mr. Barkee's students are enjoying the new class. It's nice to get some samples once in a while too! South Seneca Middle High School's Choral Music Department is excited to announce the acceptance of two seniors, two junior, and one sophomore into Sr. High Area All-State Chorus. 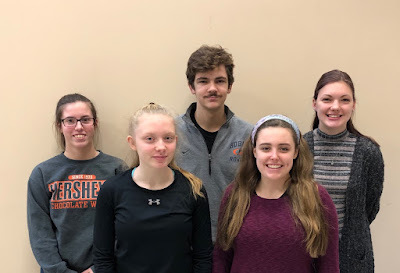 Please congratulate Chamberlain Bauder (Mixed Chorus, Bass, Grade 11), Sarah Corning (Treble Chorus, Alto, Grade 12), Hailey Crane (Treble Chorus, Alto, Grade 10), Madelyn Houck (Mixed Chorus, Soprano, Grade 12), and Violet Meagher (Mixed Chorus, Soprano, Grade 11) on their acceptance into Senior High Area All-State. Singers selected to Sr. High Area All-State are chosen based on their NYSSMA scores from Solo Festival the previous year. It is a great honor to be chosen among hundreds of applicants. They are picked from all the applicants in NYSSMA's Zone 3 in grades 10 through 12. Zone 3 is one of the largest zones in the state. All of the participating South Seneca students contribute much to the Choral Music Department. All participate in High School Chorus and also participate in the award-winning, select ensemble, Vocal Jazz. Singers worked with guest conductors at Binghamton University on February 1st and 2nd. All ensembles presented a concert at Binghamton University's Osterhaut Concert Hall on February 2nd. Peter Trim, a senior at South Seneca Middle/High School, was selected to sing Bass II in the Honors Choir Festival at Roberts Wesleyan College this past weekend! Peter participates in Band, Jazz Band, Chorus, and Vocal Jazz at South Seneca. Thanks for checking our latest High School News. There is always a lot going on in the High School, and we try to keep you informed of important news and activities. Please see the articles below, and if you'd like to see anything in particular, please let me know. Congratulations to South Seneca All-County Participants! This year's All-County Choral Festival took place at Groton High School on January 18 and January 19. 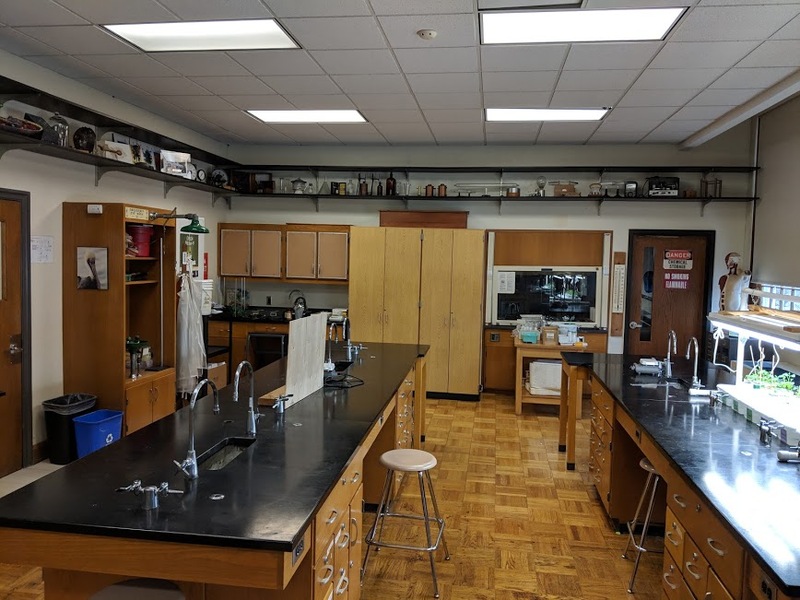 Participating districts included Dryden, Groton, Ithaca, Lansing, Newfield, South Seneca, and Trumansburg. The students who were selected to attend this year's festival worked with guest conductors during the festival weekend. The High School Guest Conductor was Mr. Adam Good. All of the students presented a concert on the afternoon of January 19 at 2:00 PM. The following high school students participated in last weekend's concert: Catlin Cornish, Madelyn Houck, Violet Meagher, Olivia Morton, Amanda Richardson, Ellen Appleby, Natalia Anderson, Sarah Corning, Samantha Marion, Emma Seamon, Aden VanCleef, Chamberlain Bauder, and Tom Smalser. 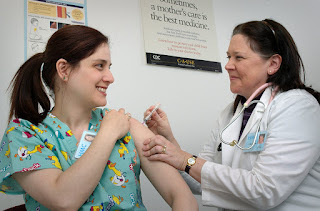 Please see the document linked in the title for a flu notice from New York. Click the link above to see testing dates, general directions and BOCES notes for Regents testing January 22 through 25. Our Library and Media Center Rocks! The South Seneca Middle/High School Library is currently receiving hundreds of middle/high school books from Scholastic and Reading Warehouse. They were purchased with a small amount of the Dollar General Donation money we received last year. We wanted to inspire literacy through reading books: physical ones, ebooks and audiobooks. These high interest books are a small gift to every student in our school to help create a mini library in their homes at the perfect time of the year. Students are allowed to chose 2 books each and the books are sectioned off in 2 groups- middle 6-8 and high school 9-12. After students choose the 2 books they are able to order “a book of their choice” to be available in mid February. You can follow our library on Instagram @ ssmh_library and Twitter @SSMHS_Library to see all of our contests and latest book releases and be in the KNOW. Thanks to Mrs. Gale for doing such a wonderful job. If you haven't seen our Facebook page, please check it out here. It's a great source of information where we can post relevant info quickly. Thanks for taking a look! Thanks for visiting our latest High School News. 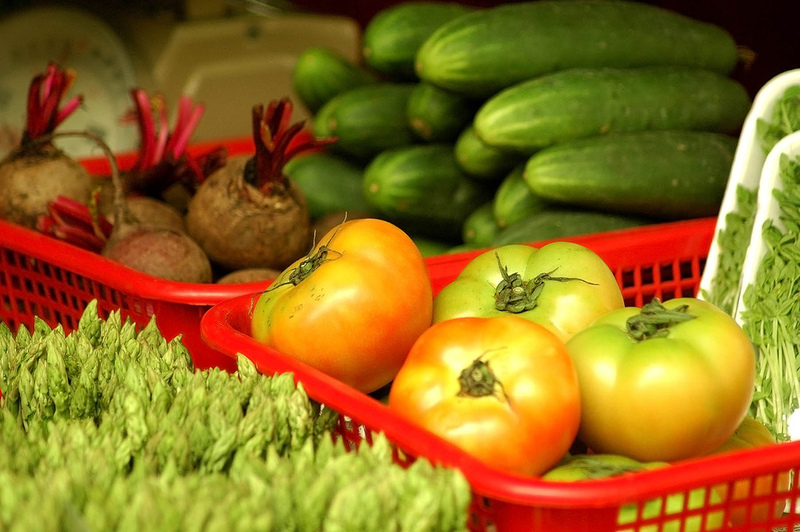 We have some great student stories below, as well as the Cornell Cooperative Extension Farm to Table news. We also have two linked articles that are definitely worth your time. The first article is about "Juuling" or "vaping," and the second article is about the effect of screen time on our kids. I hope you all have a great Christmas and holiday season. Great job students, keep up the good work! Although Juuling is increasing in popularity, studies show that it is damaging the bodies and minds of adolescents. 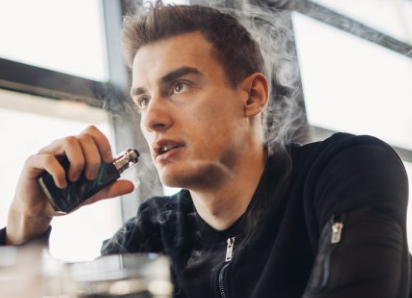 Click the link for an informative read about the various dangers of Juuling: "Many seem to believe that the use of e-cigarettes is less harmful than smoking cigarettes, but the health effects of long-term use are still not known. 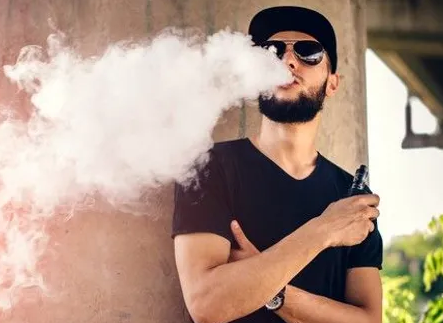 And according to some study findings, there is reason to believe that e-cigarette use causes as much or more damage as conventional cigarettes." Enjoy this edition of the "Farm to School" Newsletter to read about local news, the recipe of the month, and brush up on which fruits and vegetables are currently in season. 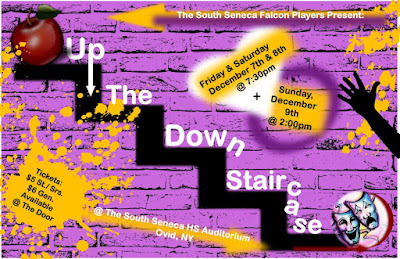 Congratulations to the Cast of "Up the Down Staircase"
Thank you to everyone who came out to see South Seneca's production of "Up the Down Staircase" directed by our own Tina Bauder! We're proud of our students for putting on a spectacular performance for this year's Falcon Players Fall Play! 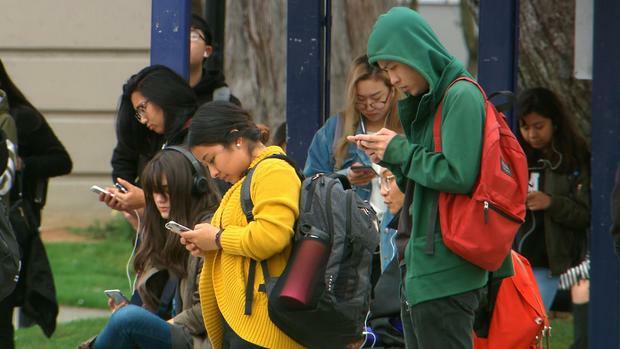 "Smartphones should be a tool that you use, not a tool that uses you," San Diego State University psychology professor Jean Twenge states in an interview. She goes into detail about how technology, specifically smartphones, are affecting the brain functions on young adults. Click the link above to learn more! Keep updated with meeting dates and events happening in South Seneca's Parent Teacher Student Association bu liking their new page on Facebook. The next meeting is January 7th at 6:60 p.m. at the elementary school. The PTSA has two student officers and represents all three schools. Have an idea or something you'd like to see? Let them know! 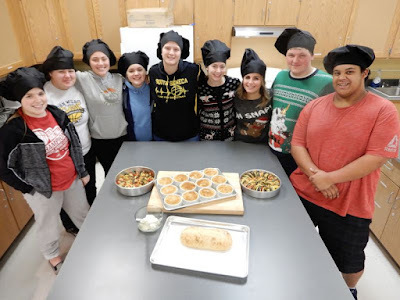 Mr. Barkee's hospitality business and food management students recently enjoyed the ratatouille and scratch-made macaroni and cheese they prepared in class. They teamed up to make two pans of the Ratatouille and began by preparing a Sauce Tomat to use in the dish. The ratatouille also contained sliced eggplant, yellow squash, zucchini, mushrooms, red and yellow bell peppers, onions, and spices. Students used leftover Mornay sauce they made from the béchamel sauce in the Mother Sauces Lab to prepare the macaroni and cheese. The macaroni and cheese was topped with toasted bread crumbs and cheese and baked in the individual ramekins. Mr. Barkee gave Mr. Houseknecht an extra helping. Needless to say, Mr. House was blown away by how good it was! 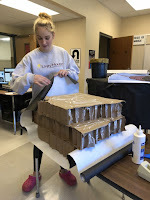 The library showed their creative holiday spirit by creating a replica of the Hogwarts Express using cardboard, glue, and wrapping paper. Kayla Park, Kenny Duckworth, and Tyler Thuering were among the students who helped make the Hogwarts Express display for the library. 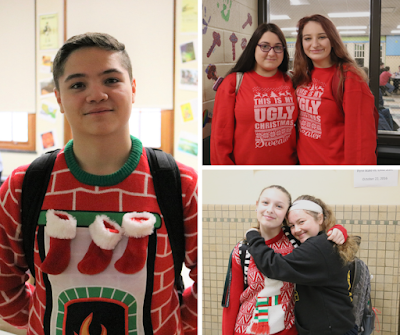 South Seneca gets into the holiday spirit on Ugly Sweater Day! Congratulations to Mr. Eastman for a wonderful classroom makeover. 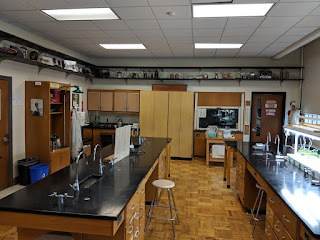 Mr. Eastman moved his science class this year. In addition to cleaning out many old materials, he salvaged some for some tools and models for some great decorations. Please share the great things happening at South Seneca! Interesting lesson in the classroom? Student accomplishment? Let us know! Here's how: If you would like to have something shared in our news, either in this blog or somewhere else, you can visit Public Relations Tip Form. Please feel free to contact me at 607-869-9636 or thouseknecht@southseneca.org. 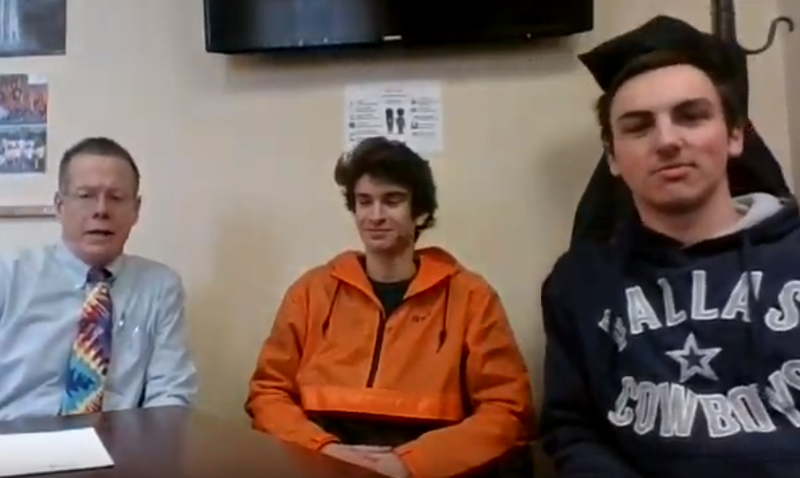 Thank you for visiting our High School News site. It's been a busy year as usual, and it's going well in the High School. Our students are taking advantage of our many programs. In the following months, I'll be sharing stories from various classrooms and extracurricular clubs. If you would like to have something shared in our news, either in this blog or somewhere else, you can visit our Public Relations Tip Form. Please feel free to contact me at 607-869-9636 or thouseknecht@southseneca.org. I hope you all have a wonderful holiday season. Please click here for our honor and high honor roll lists for the first quarter. Congratulations to all! 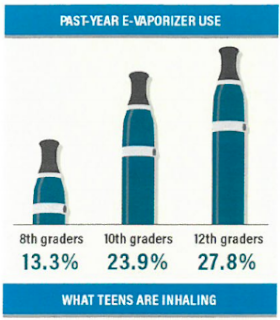 Help Your Student Avoid "Vaping"
Our colleagues at BOCES recently completed a letter that offers help to families concerning the use of e-cigarettes. "Vaping" is popular habit these days, and we're trying to spread the word about its dangers. Please take a look and share with others. Please click here for the letter. The South Seneca High School Trap Club Team took first place conference honors in the recently completed Fall League in the NYS High School Clay Target League. South Seneca competed with Indian Lake, Paul V. Moore High School, and Truthville Christian Academy in Conference One. Twenty three schools competed in four conferences across the league. Team members included: Ellen Appleby, Greg Brewer, Damon Cooley, Mackenzie Coyle, Hunter Denmark, Lexxi Hayward, Jon Kaiser, Matt Kenyon, and Brandon Vanselow. Team member Matt Kenyon took the overall top male average for the conference and finished third overall in the state with 22.7 per round average. Mackenzie Coyle and Ellen Appleby finished in the top ten for the state and Lexxi Hayward placed in the top 10 for the conference in the girl’s division. Brandon Vanselow, Damon Cooley, and Greg Brewer all placed in the top 10 for the conference for the boys. On a side note Mackenzie Coyle was on pace to finish in the top 10 overall in the state until an injury took place in week three. She bounced back and still finished second on the team in overall average with 20 per round; only 1.5 behind the overall top female for the state. Matt Kenyon had two rounds of 25 straight during the season and Ellen Appleby and Brandon Vanselow each had one round of 25 straight. Greg Brewer finished on a strong note as he had a personal best combined score of 42 in the last week of competition. The Fall League consisted of five weeks of competition. Each athlete shot two rounds of 25 targets per week. The team was coached this fall by Steve Coyle and Bill Hardy. The school adviser is Matt Barkee. The trap team is a school club open to all students in grades 7-12. The South Seneca Club will participate in the Spring NYS High School Clay Target League which will take place in March of 2019. This year, we started a new Foods class with Mr. Matt Barkee. 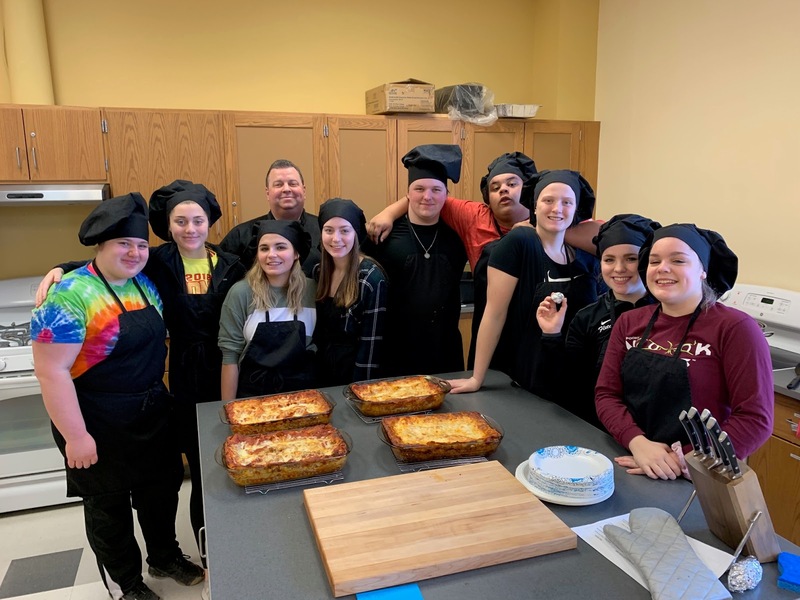 Mr. Barkee had a career in the restaurant industry, and he's sharing his management and food prep skills with students. The course has been a huge hit, and the principal even gets a treat once in a while! Thanks Mr. Barkee! Finger Lakes Friday in the South Seneca cafeteria means serving recipes that involve healthy, locally grown fall foods. 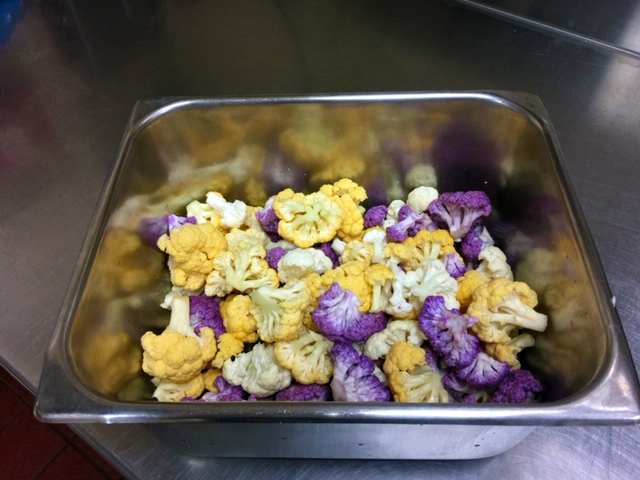 This cauliflower medley consisted of yellow and purple cauliflower grown by Finger Lakes Farms and distributed through Headwater Food Hub of Ontario, NY. The original white cauliflower was purchased at the Amish Auction in Romulus. 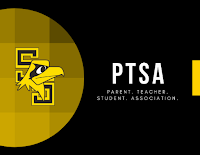 We have started a Parent Teacher Student Association representing all three schools at South Seneca. Come join us! The next meeting is Monday November 26th at 6 pm in the Elementary Cafeteria. Membership forms can be found on our Facebook page, sent home with your child, or request one by emailing SouthSenecaPTSA@gmail.com. Students may serve as committee chairs and in some of the officer positions. This is a great way to gain experience and build the student resume. We will be most successful with participation from Parent, Teachers, Student and Administrators from all three schools. Have an idea for an event? Email us or message us on Facebook. We appreciate your support! Good things to come as we grow and develop the South Seneca PTSA. 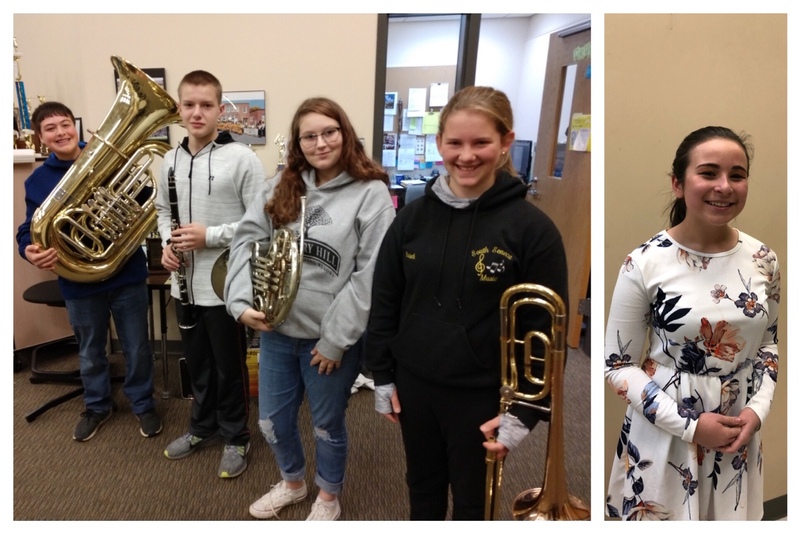 South Seneca Middle/High School is honored to have several instrumental musicians and a choral singer selected to attend this year's Junior High Area All-State. Congratulations to Natalia Anderson (9th Grade, Alto), Joey Borst (9th Grade, Tuba), Kathrine Buisch (7th Grade, Trombone), Luke Dendis (8th Grade, Clarinet) and Amelia Helfman (9th Grade, French Horn) who were accepted. Applicants for Junior High Area All-State are currently in grades 7 through 9. They apply with their NYSSMA (New York State School Music Association) Solo Festival score from the previous year and a teacher recommendation. Applicants are from NYSSMA's Zone 3, which goes from South Seneca to near Binghamton and near Syracuse. Applicants with the highest scores and levels are chosen to fill a limited amount of seats in the two choruses. Students who are selected work with a guest conductor over the period of a day and half and present the music they worked on at a concert. Come to our fall play - Up the Down Staircase! Our students are given many opportunities to explore. We strive to find quality programming, not only within our walls, but outside of school when possible. Please see the stories below as examples. We will always be looking for innovative ways to get students involved and inspired. It's hard to believe we're just about 3/4 of the way through the school year. As the school year comes to a close, feel free to contact teachers, guidance or me with any questions. We want to help students have the best possible outcomes as we finish the year. Thanks for your support. April 21 - STEPS Day of Service Click the link for more info. We're looking for as many students as possible to be involved in this great project. April 23 - Save a Life Tour See link for company details. Students will have access to driving simulators during learning labs or lunches. 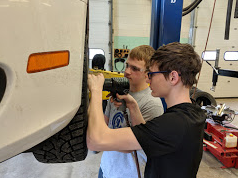 The more knowledge we can get students about the vital skill of auto safety, the better. May 2 - Funding the Future Show This is a program that's being brought to us free of charge. This is a unique way of getting students vital financial literacy knowledge. It starts with a rock show and ends with financial literacy! See the link for details. Our extended day program has proven again this year that the ability to not only meet students' academic needs but to pique their interest and further their passion is the way to increase student participation in an after school program. We have been able to maintain several of our programs that tap into the student athlete population. Partnerships with outside providers for unique opportunities have increased this year. We continued our STEM program with the Cornell Cooperative Extension and our Outdoor Adventures that hosted skiing this year. Additionally, we have added a horseback riding program with a community business. Academic support has increased to more consistent availability with staff available four days a week since the start of the spring session. Participation numbers are higher than last year and we hope to see the continued upward trend with dedication and willing support of our staff to not only make themselves available, but to help share their own interest with our students. Gardening: Mrs. Parsons will be moving to the high school for 9th and 11th grade English next year. With her move, she is adding a gardening course. Details of the course still need to be worked out, but it will fit in very nicely with our geographic area and surrounding agriculture industry. Mr. Matt Barkee will be adding a food industry course. Students will learn skills like food preparation and restaurant management. We're very excited about our new courses, which will allow students great career related learning. Mr. Anderson has been recruiting students for these new and exciting courses. With our Building Planner, we're making it easier to find out what's happening in the Middle and High Schools. Ovid Building Planner link under the Calendars title. 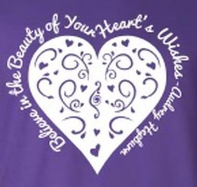 You'll find the letter days, various events, and even fund raisers. I hope you find this useful. Senior Dom Kio has been in the BOCES culinary arts program for the last two years. 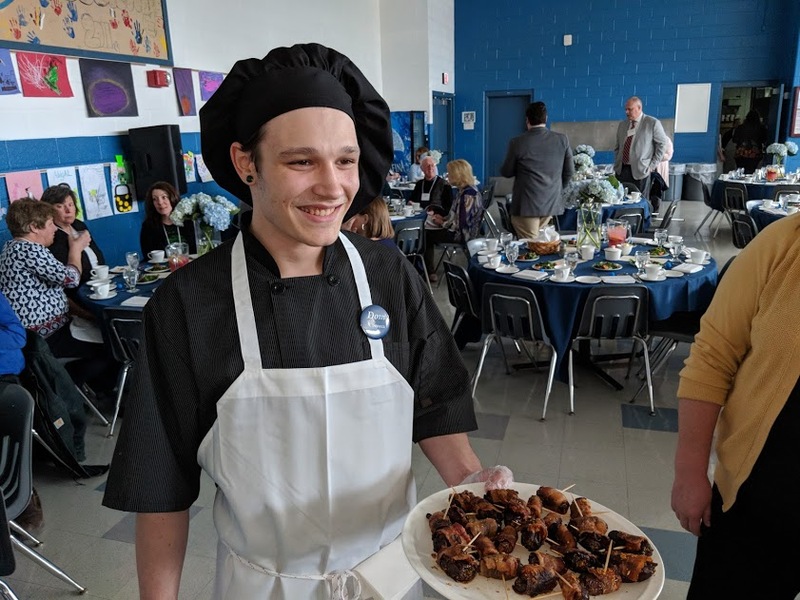 He recently served dinners, appetizers and desserts to local school officials at the BOCES budget meeting. Dom's dishes were delicious, and he has really enjoyed his time at BOCES. We appreciate Dom's hard work in the program. As Mrs. Fran Copp's career comes to a close, we want to show our appreciation. She has had a great influence on many students, including Hannah Porter, picture here. Thanks for taking a look at our latest High School News. As with other times of the year, January was a busy month for us. Below are a just a few of the things that happened. Feel free to contact me at any time with questions or comments. If your child is encountering any problems, please let us know. We have very dedicated and caring staff that is here to help. A couple of good sources for contacts are our Guidance Department page or our Staff Directory. You can also check our communication guide, which is linked from both the middle school and high school home pages. Thank you very much for your support. Congratulations to all our wrestlers on a great season, especially Keagan Carmenatty and Quinton Wormuth-Mundell. 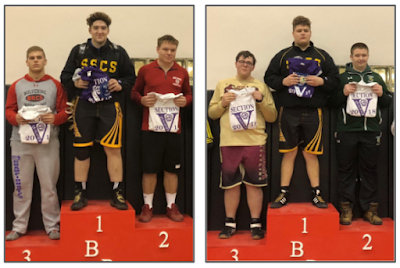 Keagan (left) is the Section 5 Class B 220 lb. champ. Quinton (right) is the 285 lb. champ. Hannah Podgorny, a senior, is challenged with some health issues. The senior class is selling some tee shirts in her honor. Please see the post here, which is on the school website. The Racker Center in Ithaca is holding this meeting. Family members, students, school staff, providers and community members are encouraged to attend. Please click here for more information. They still have a few spots available. During our midterm and Regents testing days, several teachers had special events for students. The special schedule allowed us to have some longer times that usually wouldn't be available. Shown is one of Mrs. Copp's guest artists. Art students enjoyed two 3-hour sessions on January 24. 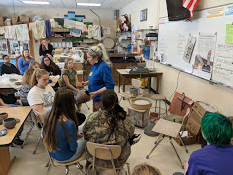 In the morning, we had painter Kari Ganoung Ruiz with the Drawing & Painting students and in the afternoon we had potter Mary Ellen Salmon with the Ceramics students. 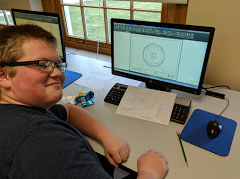 Our Computer Assisted Drafting (CAD) class had a 3 hour project. Shown here is sophomore Brandon Vanselow. 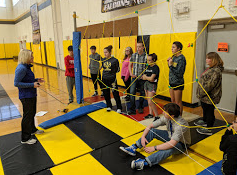 Ms. Guinan and Mr. Ovenshire ran some team building activities. If you have a printed calendar, please fix these 2 issues. Sorry for the errors. March 7: This date should be listed as "Early Dismissal" only. On an early dismissal day, students in the middle and high schools are released at 12:45, and students in the elementary school are released at 1:45. May 16: The middle and high schools only have one parent conference day on May 8, not two as the printed calendar states. If you have a printed calendar, please label May 16 as PK-5 only. Yorkers Club is South Seneca’s international travel club in the high school. The club has traveled to many destinations, including Spain, France, Italy, Germany, Switzerland, Ireland, Wales, England & Costa Rica. In March of 2018 the club will go to Germany, Poland, Hungary & Czech Republic! Anyone can join and start fundraising! Students must be in Grades 9 - 12 to travel. Students vote on the next destination in the Spring, so ballots will be coming soon! 8th graders will be eligible next year, and can vote on the ballot this spring. 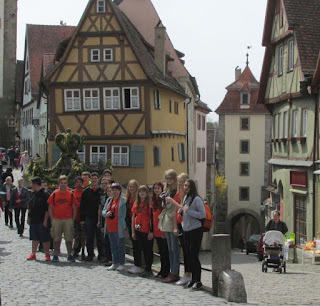 Please review this valuable article that covers advantages of student travel experiences. If a student is interested in traveling, he or she can see Mrs. Sanchez in room 218 to find out more. Parents can contact her at ksanchez@southseneca.org. Five South Seneca students received the highest honor from the Scholastic Art & Writing Awards, announced January 30, 2018. See the post here from our website. 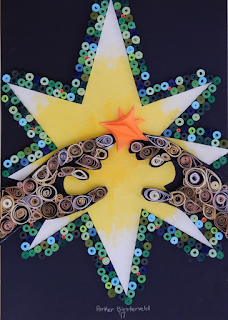 Once again, Mrs. Copp's art students are shining. Thanks to Mrs. Copp and others for organizing our latest Falcon Flyers events. Please see this document.